Every girls knows that there are hard to dress days, that sometimes we literally don’t have anything to wear and so on. What to do if you still have to go to work? Here some items and outfits with them that you can easily wear in spring and spring to summer period when you don’t know what to choose. Culottes became popular several years ago and they are totally on trend. 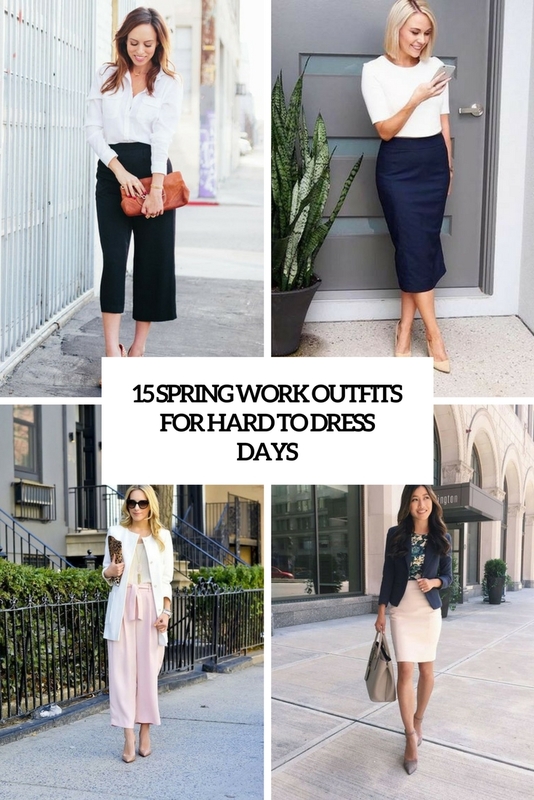 This is a great way to spruce up your work wardrobe and look edgy any time. Put on culottes, choose a top that you like, a jacket or blazer if you want and don’t forget heels – they are a must for wearing culottes. You may go for a fresh take on classics, for example, black culottes, a white button down and some heels. There’s nothing more timeless than a button down for work. A classic white button down is always a good idea, it refreshes any look and can be worn with a ton of things. Pay attention to a striped button down as stripes are one of the hottest trends to work. A pencil skirt is always a good idea – this is a timeless office skirt that can be worn to work in any season. Don’t limit yourself to only white or black pencil skirts, try various prints, midi to maxi skirts, bold colors and slits if it’s allowed. Be bold!